Today was fun. And quick…therefore a quick blog for a quick day. Today we went to the World Famous, least I say, famous throughout the entire Universe, Irvine Mountain Mushroom Festival. The Mount Mushroom Fest is held every year in late April and celebrates the notoriously elusive and highly delectable Morel Mushroom. If you like mushrooms, the Morel is the bestest of the bestest. I have had Morels in featured dishes at fancy restaurants, but they are mostly the dried and shipped type. The ones in Irvine are straight out of the fertile grounds on Eastern Kentucky, exploding with flavor. I would venture to Irvine simply for the promise of being able to buy bulk Morels. But Irvine went a step further and added a festival to frame around the fun guy. (Fun guy…as in fungi, get it?) And I love festivals. I have been to the Chicken Festival, the Poke Salad Festival, May Days, Court Days and long since earned my ten-year pen for traveling to the Wool Festival, my personal favorite. 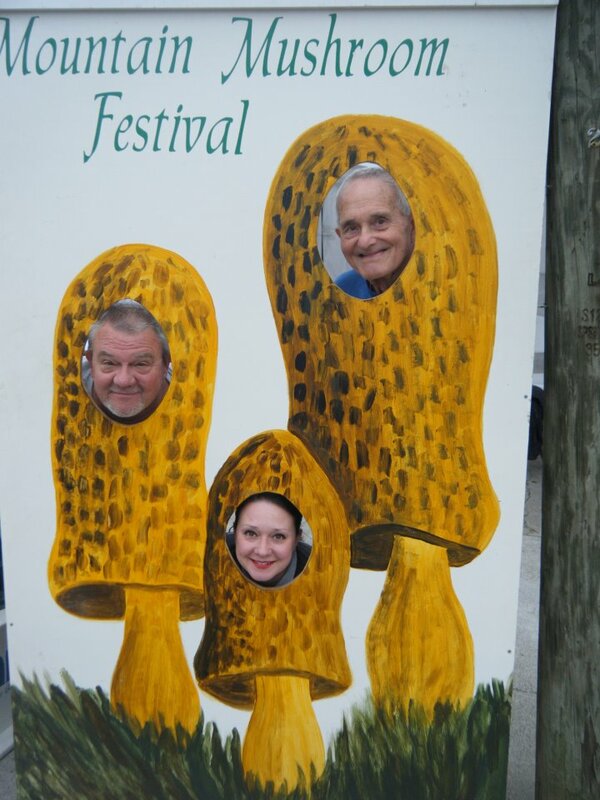 But somehow this year was to be my inaugural Morel Festival venture. I was very excited. 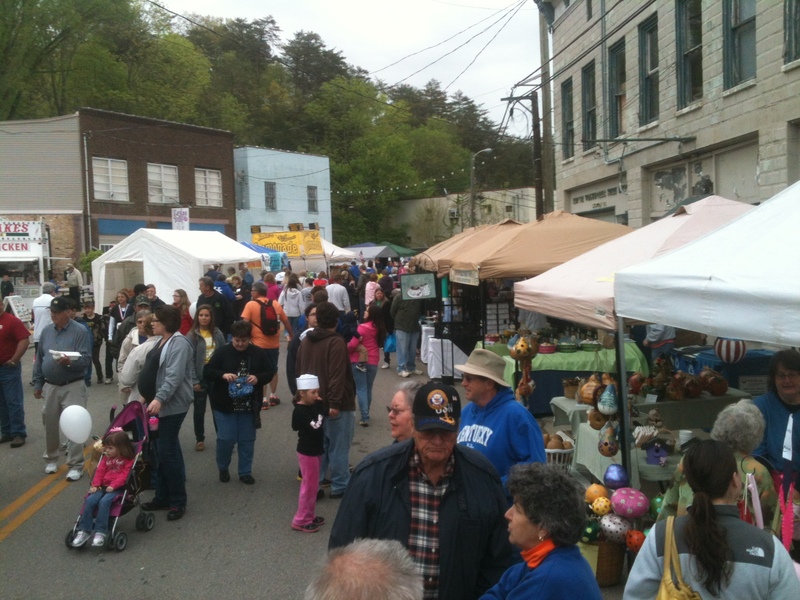 Promises of greasy food aromas, the sounds of music and the bustle of a small Kentucky town made me smile to my core. Our big Suburban boat left the docks close to noon. We headed toward Winchester for the first stop: we were to pick-up Jill’s grandfather, affectionately known as Papaw Gene. Those of you familiar with Jill’s shop already know that Papaw Gene is an Opidell’s celebrity. His wife was Opidell herself, for whom the shop was named. Papaw is quite a character and I was excited to have him along for the journey to eastern Kentucky. Our next station was Trapp, Kentucky, USA. We pulled down the driveway to Jill’s folks house and, after finishing off the last of his breakfast, collected Jill’s father and set off. We chatted about Kentucky and how much even in the hills of eastern Kentucky that things have changed from all our childhoods. Bluegrass music hummed through the speakers, a perfect soundtrack for the adventure we were on. After about 45 minutes and several straightened curves later, we arrived in the big city of Irvine. The streets were lined with cars. The sidewalks were chocked full of people, walking, shopping at road-side yard sales and socializing in a way only a small town can. Parking was as scarce a commodity as the mushrooms we ventured out to purchase. A handful of budding young capitalists set up “$5 parking” signs. Churches, Boy Scout groups and regular folks with large yards were amongst the lot to cash in on the popularity of the little mushroom. In the end, we settled on a parking lot / yard sale as the location to hitch our mount. I openly speculated that they made more on the parking than the yard sale. The lot owner just smiled and added our five-dollar bill to her growing stack. We entered the main festival area. What a sight! Everything was Morel Mushrooms. There was art done by local school children proudly displayed outside on shop windows, t-shirts, hats, artwork and even a huge wood carved Morel sculpture on Main Street. How could anyone make a caricature out of this spongy fungus? Welp, Irvine did, and with great success. The sounds of bluegrass and gospel music filled my ears as we walked by the main stage. My emotions went back and forth between wanting to slow way down and die, and to wanting to jump up and stomp my feet and holler. Such is the nature of Bluegrass music. One minute you’re wanting to kill someone, a minute later you’re wanting to die. Guess you have to have Kentucky blood to really understand. Jill talked her father and grandfather into putting their heads in one of those photo cut-out posing things. Only thing is, the cut-out was a Morel mushroom. Too funny! I took the picture. It isn’t the best picture I have ever taken, but given that I was giggling at the sight of three generations of Hensley’s posing as fungus, I think it came out pretty good. We continued down the midway. There was regular and goat soap, hot dogs with peppers and onions, recycled bottle candle holders, pop guns, funnel cakes, fresh pork rinds and cracklins, church brownies, kids running everywhere, folks catching up, chatting, sitting, meandering, leaning, and fun all around. 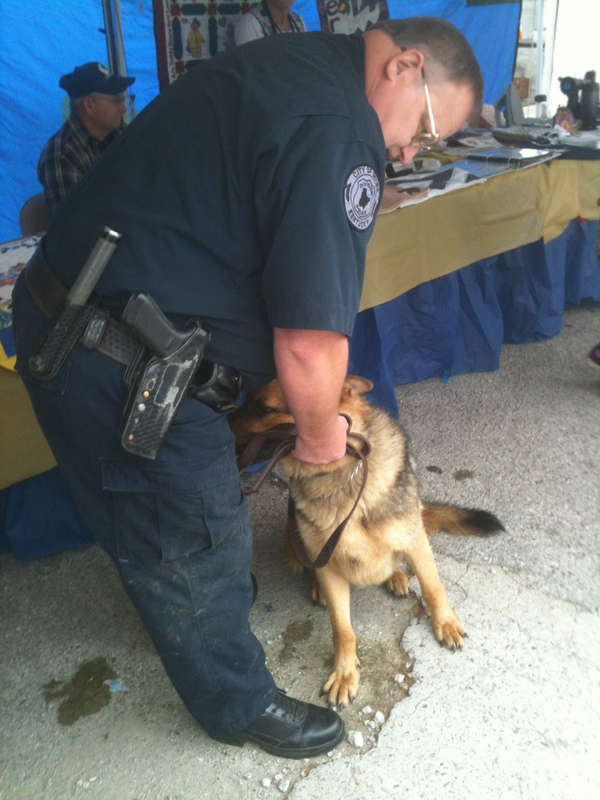 We met Fritz the police dog, who had a tick on his eye. “Hell, I tried to get it off her, but when I did she nearly bit me. I figured she can just keep that tick then,” her partner told me. Fritz and her handler were newly assigned partners, still trying to get used to each other. Time will tell who becomes the true master. We even got a glimpse of a celebrity…Tim Farmer, host of Kentucky Afield on KET, put on a Morel cooking demonstration. “Y’all like butter? I like butter. Can’t go wrong with butter can ya?” he asked the crowd while whipping up some good smelling vittles. When we had seen all the sights we could see we headed toward the parking lot-garage sale. Jill had about a pound and-a-half of Morels she snuck in and purchased when the other negotiator low-balled lower than the seller would take. Jill’s fierce negotiation tactics had paid off when she offered just a bit higher. The seller cried, “sold to the purdy lady,” and off she went like a thief. We boarded the truck and headed back thru the town, quickly returning to the wildness of east Kentucky. Papaw Gene reminisced about a grand hotel serviced by a sulphur-springs in Estill County. I thought at first he surely had been mistaken. Afterall, sulphur springs are great tourist destinations. How could that have closed? But sure enough, when I returned home I looked into the validity of his memory, and found that there is a spring in Estill County. A spring that most likely pre-dated human’s existence in North America. And there had been a grand hotel near the site of the spring, boasting 120 rooms and several cottages. Unfortunately it burnt to the ground in December, 1932, never to be rebuilt. What a shame. It would seem that a draw like a big hotel and springs could really bring Estill county back financially. 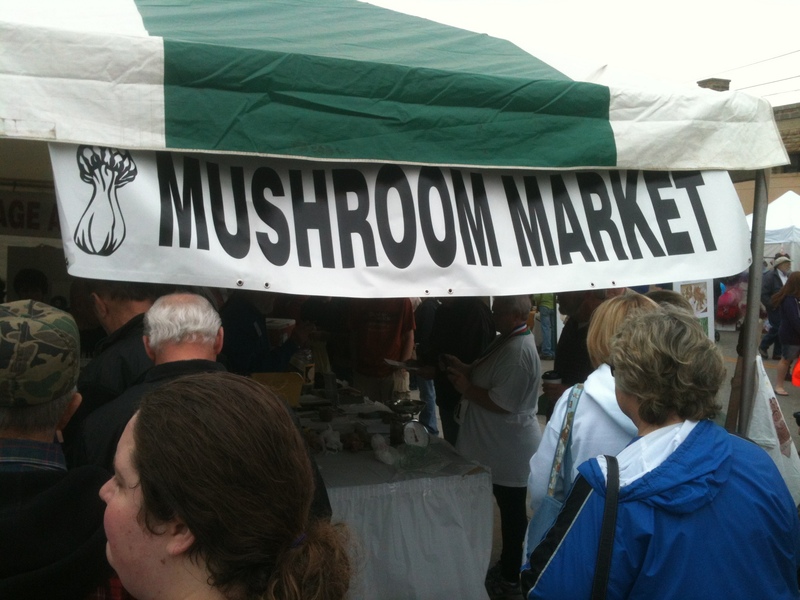 But on the other hand, seems like they are doing pretty well with the mushroom festival. Still, makes me wish I could see the grand old hotel back in its glory days. On the highway back, we chatted and gossiped and told lies. It was nice to take a lazy drive thru the gateway to eastern, Kentucky. It is nice to get out-of-town once in a while and rediscover your roots. It makes it even nicer to be with people who remember how it was back in the good ol days. Chatting with Jill’s grandfather gives him a chance to remember, and us a chance to imagine. It’s like modern folk-telling, passing down memories from generation to generation so they aren’t lost forever to time. It’s sad and beautiful simultaneously. We dropped off Jill’s dad without visiting since Jill was heading in to her shop. I pointed the nose down the last section of curvy roads toward Winchester. It’s not possible, nor would I want it to be possible, to get together with Papaw Gene without remembering his wife Opal, born Opidell, and remembering. I knew it would make Jill sad, but sometimes remembering isn’t for us…it’s for the person remembering. He said he missed her. I silently thought to myself. I never knew Jill’s grandma before Alzheimer’s had already started affecting her. However, I do remember that she was a firecracker. She was feisty and didn’t mix words, had a good sense of humor and a warm way about her…accepting me even though she may not have even known who I was. A grandmother in all senses of the word. “You know..don’t wait until it’s too late to tell someone how you feel about them,” Papaw Gene cautioned. Knowing how he felt and feels about his wife, I bet Papaw relayed his feelings loud and clear. You can’t tell them too much though. I bet that is what he really meant. We entered the traffic of the interstate as Jill and I sat quiet. We smiled at each other, our hands meeting as we headed back to our lives together, raising chickens, watching ducks, playing with dogs, polishing antiques and contemplating the next adventure. Although, tonight the adventure would be no adventure. We would relax, spending the last moments of the day gazing out across our lawn and giggling at our neighbor cursing his weed eater while we sipped wine, happy to have each other, if not forever, at least for tonight.